Whispering Pines Cabins were built about 50 years ago. They were rented nightly at that time. Later they became summer cabins. 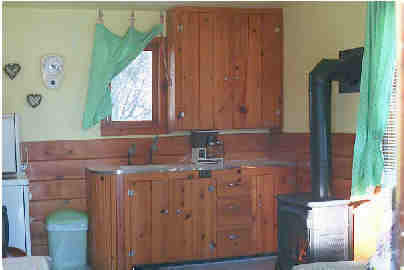 They were purchased by Cal and Jeanene in 1999 and restored for use as rental cabins. Each cabin now has its own distinct style, one decorated as a garden cottage, the other as a cabin in the woods. The cabins retain their knotty pine paneling and vintage atmosphere. Your hosts at Whispering Pines Cabins are Cal and Jeanene Neill. We hope you will enjoy your stay with us and come back again. Call us at 208-634-5998 for information and reservations or email us using the Contact Page.